Very nice staff. Good location. Closeby Tokyo station and across the subway entrance of Hachoubori. Clean and well organised. Had a really nice stay here even though it was just a short while! It was a lovely stay at the wise owl Hostel! Nice helpfull staff. Good ice Coffee! The owl at The reception desk is a bit strange. But maybe other values about animal care. The stay was wonderful! Perfect hostel op een hele goede locatie. Vooral de metro voor de deur maakt het heel fijn. Verder onwijs leuk personeel dat altijd een praatje maakt. 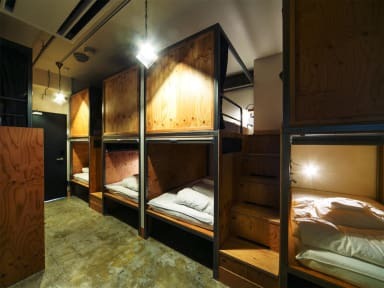 A nice and well located hostel close to Tokyo station. Nice bunkbeds and very friendly staff. Also houses a restaurant, a bar and a club in the basement. It lacks a real common area with a nice atmosphere. I had a comfortable time staying at this hostel. The staff was very friendly and the facilties were good! The capsule was very comfortable, and I had two good nights of sleep! I would definitely recommend staying here! Public transportation is right around the corner and I was in asakusa and the tsukiji market in less than 20 min. However, I was traveling solo and this hostel wasn’t a good place to meet other people easily, as other people already commented. Great hostel where you get good value for your money. It was clean with great beds. Free towels, soap/shampoo/conditioner, bathslippers and safe. Beds provided a lot of privacy. Lounge area was a bit disappointing as there were not a lot of places you could comfortably sit and thus no one really hung out there at night. If you are travelling alone and looking to meet people, this might not be the best choice as there is little contact between guests. Location next to the station was conveniant. 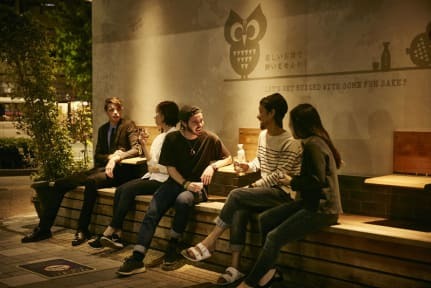 Wise Owl hostel was a perfect stay for me because I wanted to visit the Tsukiji fish market, which is very close to the hostel! The beds were really nice too. Cleaning of the rooms begins quite early, so don't expect much sleeping then. Atmosphere in the hostel was none to zero so don't expect meeting a lot of people here!